Just a random update for my blog from last week. 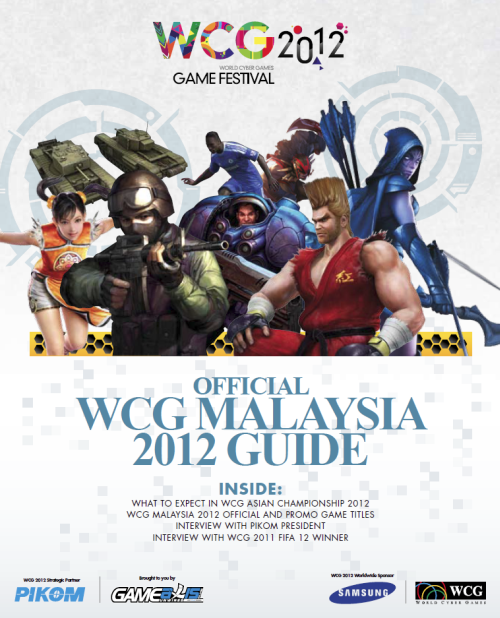 I attended the WCG Malaysia 2012 and here I am, writing a review about it. I sort of fancy the logo this year. I find it to be eye-catchy with its colorful fonts. Here is the list of games for this year. Sorry people, LoL and HoN are not available this year. Sigh, I thought I could see some LoL cosplayers this year. I expected Riven or Ahri but too bad, this year do not have the games. As usual, Samsung seems to be the sponsor and there were a few competitions going on during WCG. There was a competition going on on Facebook: Samsung Super Match. The players stand a chance to win a 1 unit of Samsung Notebook Series 7 Gamer. Apparently, Tony won the laptop. There were also mini games competitions such Fruit Ninja, where the one with highest score can win a Samsung product of the day. Somehow I was disappointed with this year's WCG. It wasn't as exciting as the years before. I thought interesting games such as Team Fortress 2 will be on list. Although Razer is one of the sponsor for WCG events, I still prefer Steel Series to be around. To be frank, I'm a Steel Series fan (but I'm not using any of their gears wtf) and always fancy their design more than Razer. Talk about the Internet connection, how could more than 15 people share 20Mbps Internet speed? If you are organizing an Online game competition, aren't you suppose to have at least 100 Mbps because not exactly 100Mbps is equally shared among 15 people? There are anonymous out there could have been using the Internet speed. If players could win a game with the lagness, sorry to this, they are not even winning the game with skills.